A day job doesn’t tend to derail training for professional athletes because, well...it is their day job. But for the amateur, life has a funny way of disrupting a workout schedule. Work, school, and family obligations often leave little time for conditioning, and fitting in training sessions requires a greater amount of organization. Because of limited time, many athletes may find working out with friends, clubs or teams an excellent way to achieve success and realize goals. Joining a Masters swim group, a running club, or a bike team might seem a little daunting, but training with others may be the golden ticket to bring your performance to the next level. Benefits of group training include increased intensity, structured workouts, accountability and support. Many workouts can be done alone, but when intensity is the focus of the session, there is nothing better than getting a bunch of competitive people together and letting them go at it! This is especially true when an athlete is experiencing a mentally challenging day. Having other athletes around can be motivating. Knowing you can depend on a structured group workout with a set time and date will keep you focused on your goals. For example, one local running club does speed work every Tuesday morning, a tempo run on Thursdays, and a long run on Saturdays. Believe it or not these people go out no matter the weather. And that kind of clockwork reliability is great. Groups thrive off the energy of their members, which creates a sense of accountability. After consistently participating with a group, you will find that you will be missed if you skip a few workouts. Even if you are not the strongest person in the group, the other members grow to rely on your energy to help sustain the workouts. If you don’t show, you can expect a few enquiring phone calls. Having the support of a group is vastly important to training. Whether you are working out for health reasons or wanting to race faster, the relationships you create and the encouragement you receive is priceless. The phrase “birds of a feather flock together” applies to fitness groups. People from all different backgrounds and professions take part in clubs or groups, yet they all share a common gravitation toward fitness. Training groups and clubs are a great way to meet and develop new friendships with people who share a similar outlook on life. Information about upcoming events and races as well as nutrition and training tips are shared among group members. Whether you are training for a triathlon or just enjoy running, biking, or swimming, join a group and see where the adventure takes you! Of course, group training has a few potential drawbacks, and you should be aware of them before you sign up. You can only maximize the benefits of group training as long as you maintain a proper balance to ensure you are attaining your individual goals and potential. As much as group settings help push you to higher levels of intensity, your body also needs recovery workouts. The body is unable to build power, endurance and strength effectively if every workout is done at a high intensity. The competitive nature of most athletes tends to create a dynamic that is not conducive to keeping the intensity low, and training with others you directly compete with can magnify this problem. As you develop your fitness, maintaining confidence in your abilities can be difficult if you consistently train with partners who perform at a higher level than you. Remember to keep your own goals in perspective and remain faithful to your training program, progressing at a steady pace. Hard work and smart training will ensure overall success. Nutrition is another potential pitfall during longer group sessions. Taking adequate fluids and calories takes practice and discipline, especially on longer rides or runs. 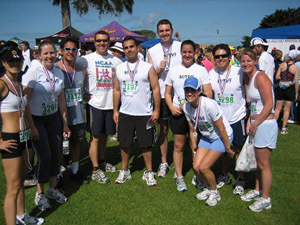 Some athletes will forgo eating or drinking enough because they are so focused on keeping up with or outperforming the group. This is just a bad situation that will lead you straight into the proverbial “brick wall”. Furthermore, nutrition advice from others in your group can be helpful, but beware of the “self proclaimed expert”. What works for one athlete may not work for another. Do your due diligence and find out the background of the person giving the advice. If the person is a registered dietician (RD) you have the assurance that he or she has a degree from an accredited institution, is licensed, and is qualified to practice nutrition. Otherwise, run that great advice past an actual RD before giving it a go. It is also wise to filter training advice given by group members. Some coaches have never competed in your particular sport but have the passion and knowledge to bring you to the next level. Alternatively, a great athlete does not always make the best coach. Again, do your due diligence and find the advice that produces results for you, and don’t just base its reliability on the results you see in other athletes. Group training can be an awesome way to get yourself to the next level. The intensity and reliability of the group, the accountability you feel toward the other members, and the camaraderie you experience can all help you achieve fitness goals. But be sure to balance the benefits and drawbacks of group training. Having the discipline to get the most out of every workout, whether alone or with a group, is important to helping you reach your athletic potential. Consider this advice. Design your workout schedule to incorporate workouts with and without company. Attend high-intensity, quality workouts with a group. Absorb the support and positive energy of your companions, embrace new friendships and enjoy the company of like-minded individuals. But demonstrate discipline and maintain training goals. Take in adequate fluid and calories. And finally, take advice from others in the group with caution. Barbara, a native of Tulsa, Okla., holds a Master’s degree in nutrition from the Univ. of Utah and is a driving force for Salt Lake Regional Hospital's Sports Medicine program. Barbara is also a competitive Age Group Triathlete, placing 3rd at Nationals in the Olympic distance and 6th at the Half Ironman World Championships in 2009. Contact her at B.sherwood@comcast.net. Wesley is a USAT certified triathlon coach and a former member of the University of Utah swim team. He loves racing and has many goals of his own to conquer in the sport of Triathlon. He loves helping others achieve their goals. Contact him at wesjohn50@hotmail.com.